Straight from Santa's workshop to your door, this lively Christmas wreath keeps the traditions of the North Pole alive with its candy-striped bow and red berry accents. 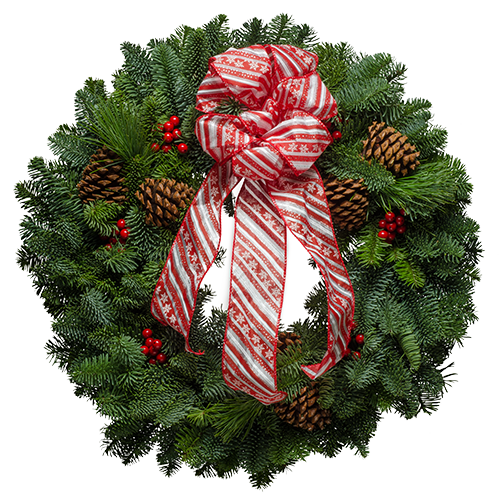 Add the rich aromas of the northern evergreen forests, and you have a wreath that will become an instant holiday favorite! "WOW! I received a gift wreath today from my insurance man. This wreath beats any of the others I've sent from other companies. It was fragrant, fresh, and easy to hang. Everything was wired meticulously, and best of all, the bow wasn't smashed since it was packaged separately. I immediately called our insurance man and told him THANKS.! I'm ordering my Christmas wreaths from Christmas Forest from now on."